Chicago is a modern city endlessly fascinated by its past. Although still relatively young compared to the Londons and Parises of the world, Chicago&apos;s demolished buildings, bygone places and long-ago world&apos;s fairs capture our attention and a fair amount of net traffic judging by the popularity of excellent sites like Forgotten Chicago, Calumet 412 and the no-longer updated but still very good blog, Bright Lights Dim Beauty of Chicago. 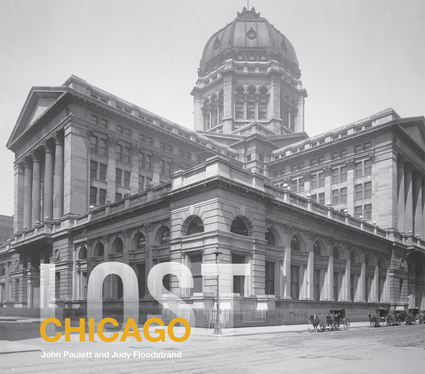 Now comes a new hardcover book, Lost Chicago, that examines the way we were in this town. Written by John Paulett and Judy Floodstrand, the book looks at architecture that is no longer with us — places like the Henry Ives Cobb-designed Federal Building seen in the photo above — but also things we&apos;ve forgotten about (until we remember) such as those three-wheel motorcycles Chicago coppers used to ride. Lost Chicago is an immensely entertaining and beautifully illustrated book with great archival photography. (I&apos;ll show you some of it when the publisher sends the images to me, so check back later.) If the book has one drawback, its that is shares the title of a well-known book written on pretty much the same subject: David Garrard Lowe&apos;s Lost Chicago. While Lowe&apos;s book is a stinging and much-needed rebuke of this city&apos;s dirty habit of demolishing great architecture, Paulett and Floodstrand&apos;s book is a wistful, but substantive look. Both have their place. This week, I caught up with Paulett and Floodstrand to talk about their book, our preoccupation with our past . . . and the book&apos;s title. Q: Let&apos;s get this one out of the way first: Your book has the same title as writer David Garrard Lowe&apos;s famed Lost Chicago. Was this a concern? JOHN: I love David&apos;s book. I think it is one of the best books about Chicago, not only about architecture but about the way Chicago has developed. I also think that David is a great scholar and you can really enjoy the fruits of his work. Our version of Lost Chicago is part of a series that includes Lost New York, Lost San Francisco and other books. I wondered about the title when the publisher proposed it, but we needed it to be included in the series — we absolutely did not want Chicago to be left out. I own David&apos;s book and I really hope people will consider buying both of them. I think they are very different and readers will enjoy each of them. JUDY: Yes, actually, I was a bit surprised that the titles were exactly the same. But Anova Books has a series of these Lost book from other cities and keeping the continuity of the series name was important to the body of work already published and those that might be covered in the future. Q: Your book has plenty of lost Chicago buildings, but you go deeper than architecture. You look at things like lost transit and signage. Why were these things important to examine? JOHN: The architecture of Chicago is very important, but we were really interested in something of the smaller things that have been lost — often things that were taken for granted. Often, people read one of the sections of Lost Chicago and exclaim, "Wow! I hadn&apos;t thought about that!" For example, we have a section on the police riding three-wheel service cars. This may not be that historically significant, but generations of Chicagoans remember seeing these every day. I just had a Chicago native tell me how much he enjoyed remembering things like this. For some of the younger people, what might seem small comes as a great surprise. It doesn&apos;t seem that long ago that the Bears played at Wrigley Field, but it amazes many people. They love looking at the image of the ivy-covered wall just beyond the end zone. JUDY: The architecture really is the beginning of the adventure in imagining the life that went on inside of the structures and in the world around them. Living, breathing Chicagoans came and went to work in these structures. Goods were produced, laws were made, doctors cared for patients. When you take a few minutes to really sit down with these photographs, knowing and seeing these other small details really add to your understanding of the time. Q: Speaking of photographs, the images here are quite incredible. The clarity, but also views and images I&apos;d never seen before. Explain how you chose what photos made it in. And, are there any you wish had made the cut? JOHN: The credit here really goes to Judy, who did the work researching and gathering the photographs. We were looking for photos that helped to tell the story. The entire book, including the text, was an attempt to tell interesting stories. Some, such as the Japanese laborers at the Columbian Exposition, are surprising and take us into the work that had to be done to begin the fair. Others, like the scene in front of the Regal Theatre, are just such compelling human pictures that we couldn&apos;t resist them. There were so many pictures of Riverview Park that we had trouble deciding. There were also some tragic photos of the Our Lady of the Angels school fire and the Eastland Disaster that ultimately did not fit the overall theme of the book. In general, Judy found the photographs and that suggested the chapter. She has a great eye for what will work. Our guiding phrase was to "drive from the picture." Once we had agreed on a topic, I researched to try and find anecdotes and facts that might not be commonly known. We could probably fill another complete book with photos and stories that did not get into Lost Chicago. JUDY: Oh, there were so many photos to discover and access. The job of the final sorting and layout choices was made by the publisher. The book would have weighed two pounds if the decision had been left to me! Examples that come to mind are a collection of Chicago Tribune archive photographs of Riverview Park taken by Chuck Wlodarczyk that I just loved. Seeing people dressed up to ride the Ferris wheel really conjured nostalgic feelings about the past. We also could have done pages on the musicians that graced Chicago nightclubs; an amazing Yale Joel photo of Ella Fitzgerald giving an emotional performance at Mr. Kelly&apos;s in 1958 comes to mind. So many images stayed with me well past the deadline for the book. Q: Lost or forgotten Chicago locales and things are hot now. There&apos;s the Forgotten Chicago website, numerous new books on what once was, etc. What&apos;s going on here? What&apos;s pushing this, if anything? JOHN: I have to plead a little guilty on that. I have two previous books about Chicago locales: Forgotten Chicago and Printers Row. After Lost Chicago and Forgotten Chicago, my sister asked me if I planned Dimly-Recalled Chicago. More seriously, I think the people of Chicago have a great pride in their city. They love seeing the buildings and people and institutions that have built it. Lost Chicago and books like it are great fun to look at together. People can share memories. I gave a talk to a group about Chicago history. The talk was scheduled for 45 minutes. I had decided to focus on the old train stations. At the beginning, I asked if anyone had any memories of the beautiful transportation palaces. I think those are the last words I said. People poured out their memories. JUDY: Hard to say, but Baby Boomers really have seen amazing changes in their lifetime. It really is another world reality that we are living in now, and who doesn&apos;t let themselves remember back to "simpler" less complicated times, before the iCloud, on occasion? Chicago&apos;s history is rich, and the details are intoxicating. Looking ahead is human nature keeping itself positioned for the future, but taking time to reflect and look back can have the restorative power of dreams. Something many of us can use during difficult times.